Stages Deli is a New York institution and they are quick to remind you of this. The newspaper clippings and photos of famous people who have stopped in for a knish show the full range of time that Stages has been serving classic delicatessen meals in midtown Manhattan. For 70 years Stages Deli has been urging all comers to try the stuffed sandwich. I remember as a young boy discarding section after section of the newspaper, ignoring all matters of politics and finance. My only interest lay in Dagwood Bumstead and his latest act of grandeur. Dagwood was something of a mythical figure from my formative years, and in the excess and experimentation of my adolescence I tortured myself with two questions: ‘Can this be built higher?’ and ‘Why didn’t this work?’ It did not occur to me for some years that it was the scale that was bringing ruin to my creations. While Stages is not guilty of piling on ingredient after ingredient the sandwich is no less ostentatious for its limited number of ingredients. I regret that the photo I have included is of such poor quality, dear reader I have seen a great number of sandwiches but the size of this beast was enough to take me aback. Almost as tall as the water glass there has to be four solid portions of turkey, more than a half dozen slices of bacon, 3 or 4 slices of tomato, and a fair amount of iceberg lettuce. The toothpick you can barely see is buried to the hilt and still did not touch the bottom third of this sandwich. I thought I understood the motivation. This had to be a sandwich made by someone who believes in Sandwiches, believes in America, believes in God, and moreover that God loves America, that God loves sandwiches, that he would bless such a towering effort. When I first saw this sandwich I marveled at the size and thought silently to myself about all of those failed attempts. Maybe I was just too young and too foolish, and some master craftsman toiling away in a noted deli had discovered what I had not. Maybe this sandwich was the magnificent creation I had dreamed of but never realized. It was not. From the first bite it became clear that this was not a divinely inspired attempt at greatness, but a callous stack of sub-par ingredients designed to flabbergast tourists. The turkey was dry and flavorless, seemingly roasted plain. The bland and mushy typical out of season tomatoes had lost whatever flavor they once had to the refrigerator they were stored in. Iceberg lettuce has its place but deployed by default it is the calling card of a hack and with one bite of this sandwich I realized I should have known. Maybe this sandwich was something some day. Maybe in the heady post-war days someone put a little more care into things and it all came together. Maybe back then something grand was possible. Now, though, now it is late afternoon in America and this is just a bad sandwich. 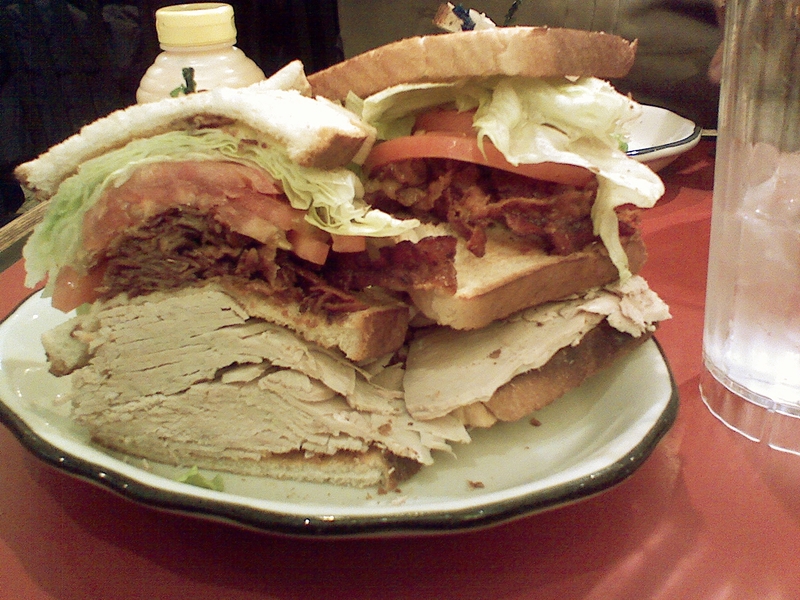 This entry was posted in Sandwich Reviews and tagged Club, New York, Reviews by Pete, Sandwiches I Have Eaten, Sandwiches Made For Me, Turkey by Pete. Bookmark the permalink. Hey Peter. I’ve eaten here a number of times and have never been too impressed with their food. My parents make it a point to go every time they’re in New York so there have been plenty more, but within recent memory I had a similarly enormous pastrami sandwich and a burger. Eh. Their desserts are pretty good and I’m grateful for the quantity and variety of pickles they give you pre-meal, but I never saw any reason for the fame of the place. The sandwich is memorable to me since it brought back my favorite blog. It’s “Bumstead.” And do they actually sell knishes? How embarrassing for me. Consider that error rectified. As for the knishes they do indeed, in both square and round served with cheese and/or pastrami and corned beef. I really love your blog. Just saying.